If you are not an Ops person, do not know anything about Linux and not a big fan of Linus Torvalds — Linux conference is for you! January this year I was lucky enough to attend Linux Conf AU 2019 in Christchurch, New Zealand. It was hard to conclude from the conference name that it is not only for the ops people. So, it was not easy sell for a Developer role, it seemed like I wanted to attend the “Linux kernel” conference and I do not even use Linux on any of my devices. My only way in was to become a speaker at that conference and I submitted few proposals. 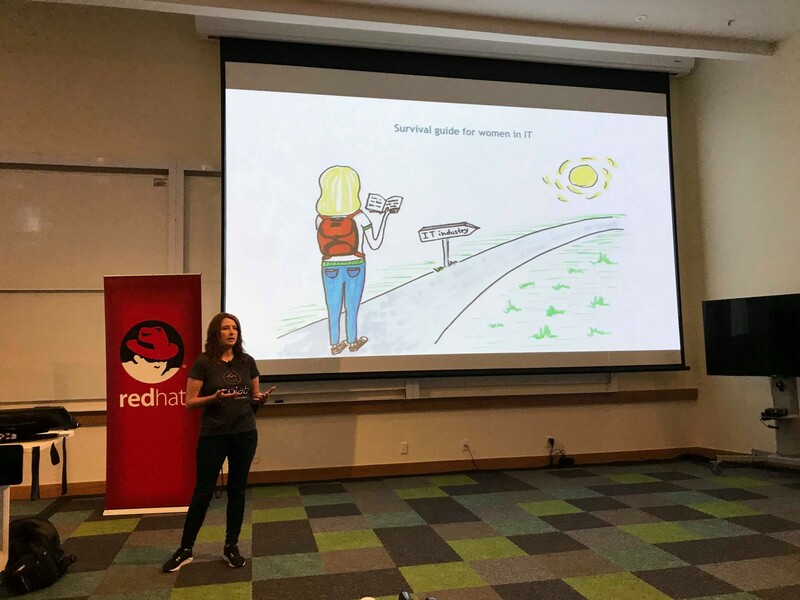 I was pleasantly surprised when my talk “Survival guide for Women in IT” got accepted into SysAdmin Miniconf. After getting into the schedule, my travel request was approved. This year conference was held in University of Canterbury, which was a bit away from the city of Christchurch, but with the big campus and students around that venue had awesome community vibe. On Monday I arrived in Christchurch and registered, I had no idea what to expect from the open source conference that focused so much on Linux. Every single day of the conference started with traditional Maori greeting, reminder about emergency services, waste management and code of conduct. Linux conference had a big emphasis on the code of conduct, I really liked this phrase from organizers: “We are bringing our best selves to this conference and we ask you to do the same”. I was excited after the conference kick off, but was a bit nervous about my talk. First two days of the conference are run in miniconf format. There were eight miniconfs this year and my talk was in SysAdmin stream, were most of the talks are quite technical, apart from mine. My ten minute slot was scheduled in between few talks before lunchtime and I tried my best to keep the audience entertained while sharing my ideas about gender imbalance in IT industry. During the breaks so many people came to me and gave me awesome feedback. My twitter account doubled in amount of followers in one hour and pictures of me and my slides were all over the #lca2019. Got my 15 minutes of fame! Second day started with incredible talk from Rory Aronson about his journey of creating farmbot — an open source robot farming machine. It was very inspiring to hear from the person, who started his project to help himself and others to grow their own food in their backyards. The rest of the day was filled with lots of talks in multiple streams. My friends Svetlana Marina and Maia Sauren were speaking in Docs Down Under stream, so I spent most of my time there listening to incredible talks about importance of good communication and documentation. That day in “Hallway stream” I met Rob Thomas and he was so kind to share with me his wisdom about lock picking. 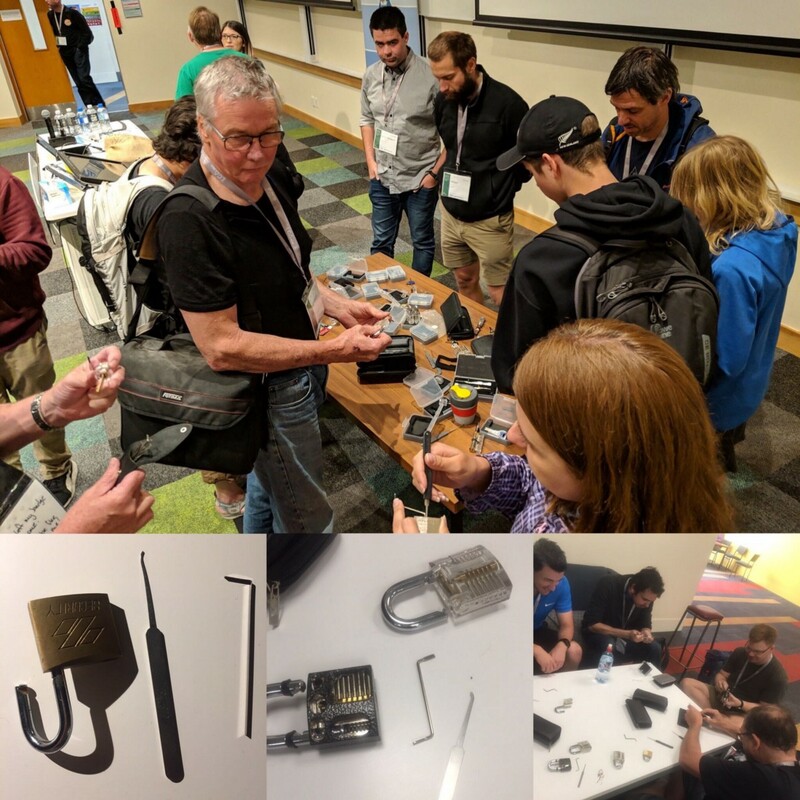 He had the whole luggage full of training transparent locks and I managed to pick the real master padlock at the end of that session. That day I also picked the lock of my hotel room, quite cool for the first day! I was lucky enough to have dinner with amazing speakers and also paper committee members. They told me how much work and effort goes into organizing and running a conference. It is enormous effort and requires lots of people’s time and ability to solve difficult problems. Linux conference is focused on community and open source, they also support local charities and very mindful about environment. Most of their swag (coffee keep cup, notepad with pen and few coffee vouchers) is environment friendly. I really liked their approach to focus on community and not on the shiny sponsors booths and fancy drinks. One minor drawback, there was no lunch provided by the conference. Therefore, everyone during lunch break wondered around the campus and sometimes I missed few afternoon talks because I did not have enough time to order and eat my lunch. Main conference officially started on Wednesday morning with very inspiring talk from Dana Lewis. She shared her story on how she built an artificial pancreas system to help people who suffer from diabetes. She was so inspiring that many people who received a free raspberry-Pi with their professional tickets donated them to this noble cause. Then I attended Sean Cross talk, where he shared his insights on how to produce a plastic case with injection molding on Chinese factory. Very interested talk! There I also spotted Linus Torvalds. There were so many good talks that day about art that is created with machine learning and AR, about ethics and security of medical devices that can be easily hacked and freely share patients information. Unfortunately, I could not attend all the talks I wanted to, sometimes five different talks were run in parallel. But thanks to the NextDayVideo company, there is the whole youtube channel https://www.youtube.com/user/linuxconfau2019 with all the talks from the conference in a very good quality! Next day I found out that robots won’t take my job and was taught how to write a virus. Of course, I pledged to never use my knowledge to harm anyone, only to create a better defense for my software! 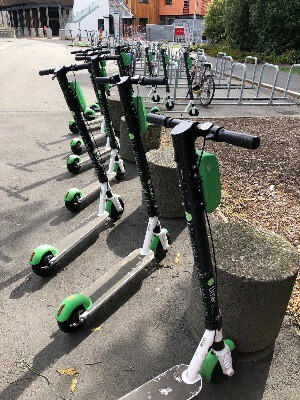 During the breaks my friend and I rode the Lime scooters around the campus and I was lucky enough not to fall from it. Quite entertaining and fast device, top speed for me was around 31 km per hour, but a bit pricey. On campus I also met few radio enthusiasts who were connecting with person from Ireland via cube satellite using radio antenna. On Friday, the last day of the conference, there were so many good talks! Lana Brindley talked about ethics of software and hardware, it made me think about my personal responsibility as a software engineer to make sure that I develop technology that does not hurt other people. During her talk we needed at least 3 mental health breaks, watch it here. Another amazing talk from Lilly Ryan about history of Arsenic and how it is related to the privacy was very informative and inspiring, video is here. Linux Conference closing ceremony was incredible! It started with short talks from all the children that were in conference child care program during the week, they shared their hardware projects they were working on. It is amazing to have such program for conference attendees. I know that some people were only able to come there because there was free childcare! Then there were three minutes lightning talks that were picked from more than thirty submissions. Such amazing format and very good variety of talks! First time I saw standing ovations on the conference for the papers committee, code of conduct people and all volunteers! They did amazing job! I was pleasantly surprised when organizers shared attendees numbers and demographics ! I’ve never seen it in any other conference or company. It is an Open conference and very transparent about how many ticket were sold, who attended it and what happened there. They just released a transparency report here. Most attendees come from Australia, New Zealand and USA, but there were some from Canada, Europe and Asia. There were only 64 women out of more than 600 attendees, so there is room for improvement. I felt a bit sad during closing ceremony, even a week-long conference is not enough. During that week I met so many smart, interesting and passionate people. I picked up few new skills. I enjoyed so many inspiring and informative talks. I felt very welcomed in Open Source community and some people told me that they would like to see me next year. I will do my best to go to the Linux Conf 2020, please join me! Next year it will take place on Gold Coast, QLD Australia!